The OneDrive Windows Store app for Windows 10 makes viewing offloaded files easier. Earlier this week, Microsoft rolled out a new Universal Windows Platform (UWP) app for OneDrive that works on PCs. If you haven’t downloaded it yet, you should, because it fills a gap in Windows 10’s native OneDrive integration. 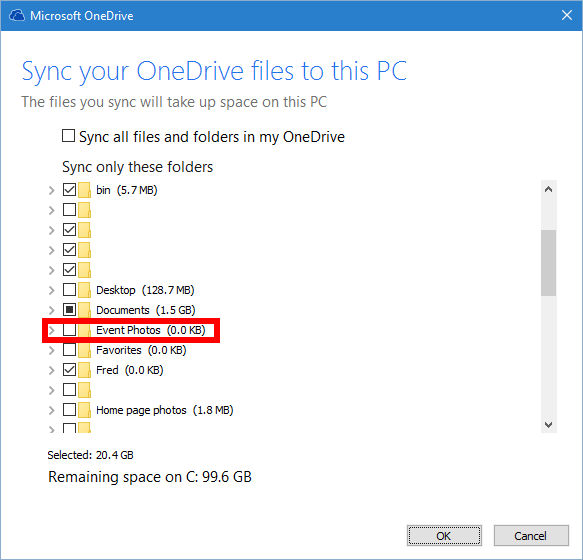 Specifically, there’s no way to see files that are in OneDrive but not on your PC. In fact, once you get the hang of using the Windows Store app, you can choose to leave some larger files in OneDrive to create more space on your PC. Once you download and install OneDrive from the Windows Store, sign-in to the app with your Microsoft account, and wait for your OneDrive files to populate. Once that’s done you are ready to offload some of your files to OneDrive, while still being able to see them easily on your PC. 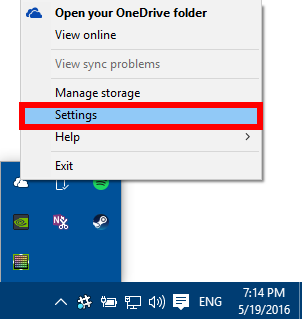 Start by selecting Settings from the built-in OneDrive utility in Windows 10. Let’s say you wanted to leave a photos folder, called “Event Photos” in the cloud, but you didn’t want it taking up space on your PC. Click on the upward-facing arrow on the far right of the taskbar, and right-click the OneDrive icon in the panel that appears. From the context menu choose Settings. This will open OneDrive’s settings window. Click on the Account tab and then select the Choose folders button. Now you’re at the window listing all the folders in OneDrive. Folders that are synced to your PC have a check mark next to them; those that are only in the cloud, don’t. OneDrive’s folder listings in Windows 10. Uncheck the box next to “Event Photos.” A warning window will pop up telling you that your files will be deleted from your PC but remain in OneDrive online. Now click OK on the warning window, then dismiss the remaining OneDrive settings windows. That’s all there is to offloading your files to OneDrive, and if you ever need them, they are just a few clicks away via the Windows Store app. You can accomplish the same thing using the Web app, of course, but in my experience the Windows Store app is more responsive and convenient. In future updates, Microsoft may add a previous OneDrive feature known as placeholders to Windows 10’s built-in OneDrive functionality. For now, however, the easiest way to view OneDrive files that are not on your PC is with the Windows Store app.